Many people feel uncomfortable going into a strangers bathroom, so when they are checking out the bathroom of a house for sale, they will most likely poke their head in the door, look left, look right and leave. This may take just a few seconds. But let’s face it, bathrooms sell houses. A beautiful bathroom with whirlpool baths, marble counters and steam showers are an extreme selling point. I’d buy a run down shack, just for the whirlpool bath! But if your home doesn’t have all of these “luxury” items what can you do to “Wow” a potential home buyer and allure them to stay in the bathroom for more than a few seconds? You want your bathroom to have a spa-like appearance. There are many different changes that you can make to your bathroom to keep that buyer interested. Some are little more pricey than others, so I will try and break them down. 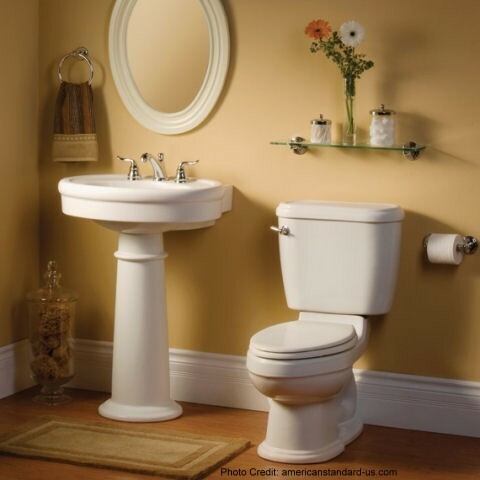 If you have a smaller bathroom, replace your sink with a pedestal sink. A pedestal sink shows off the square footage in your bathroom beautifully. Just rip out that old vanity and hook up your new sink…or hire someone else to do it for you, which is my preferred method of getting things done. Remove the big sheet mirror over your sink and those globe lights while your at it. Replace with a lovely framed mirror and add some sconce lighting on both sides of it. This removes that theater dressing room look and replaces it with a more tranquil spa-like appearance. As an added bonus, this type of lighting scheme is much more flattering to the face. Go on, make those buyers feel pretty! Replace the faucets with something more flattering. Buyers love fancy faucets! Especially ones that don’t leak, so if you do have a leaky faucet you should fix that too.